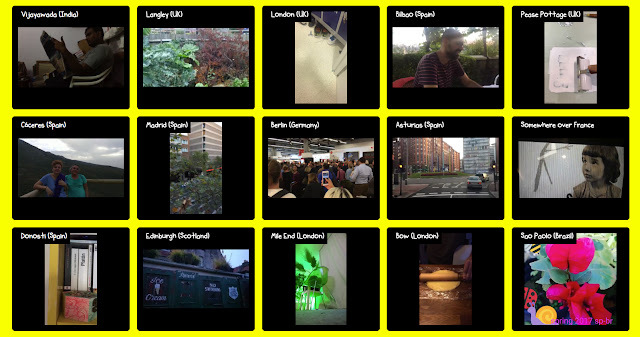 Quantum Filmmaking [Research Blog]: NOW&HERE = EVERYWHERE > MOMENT 17 at Imago Mundi Highlights (2018), Benetton Foundation and Fabrica (Italy). NOW&HERE = EVERYWHERE > MOMENT 17 at Imago Mundi Highlights (2018), Benetton Foundation and Fabrica (Italy). MOMENT 17 has been co-created on Saturday 14th October 2017 at 18:00pm BST at the core of Imago Mundi Highlights 2017-18, supported by Benetton Foundation and Fabrica (Italy). Link to Moment 17 (Mixed media, 2017). 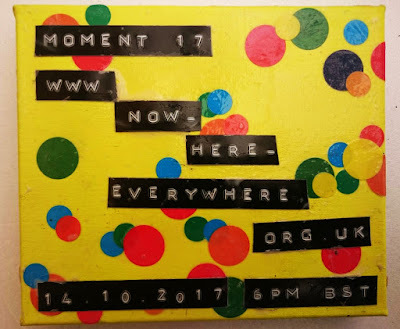 co-created internationally by 25 artists on 14.10.2017 at 6pm BST. MOMENT 17 is composed by 25 videos entangling 25 artists while filming simultaneously with their camera-phones from diverse geographical locations, such as, Bilbao and Donosti (Basque Country), Asturias, Cáceres and Madrid in Spain; London, Langley, Pease Pottage and Edinburgh (Scotland) in the UK; Sao Paolo in Brazil; Vijayawada in India; somewhere over France; Tournai in Belgium; Hamburg and Berlin in Germany; Rome in Italy and Ruthin in North Wales. MARIO MARTINEZ , ELISA LóPEZ BURGOS, STEVE GEER, SHIVKUMAR K V ART, SANDRA BECKER, JUSSARA FéLIX FIGUEREDO, LUIS ETXANIZ, MANUEL HENCHE, MARIANO MELMAN, RAPHAEL LATOUR, JONE ZUBIAURRE, JOHN LEE BIRD, IOANA PIOARU, VICTOR CANO , ELIANE FIGUEREDO , ELENA UGARTE, DEWI YARD, BELEN RODRIGUEZ, AITOR ALBO, SILVIA SUSANNA, CARLOS MARTíN SáNCHEZ, RAFA HERNáNDEZ, ION SAGARZAZU, IKER IZAGIRRE and PARRY MORALES. MOMENT 17 will be physically travelling around the world with Imago Mundi Highlights that will be at the focus of the international exhibition activities starting 2018, including major biennials and top international art events and fairs.